At the same time last night that the legacy of noted urban thinker Jane Jacobs was being celebrated at the Morgan Library and Museum in Manhattan, a prelude to an exhibit opening today, the much more modest Soapbox Gallery in Prospect Heights hosted a community forum introducing the UNITY (Understanding, Imagining and Transforming the Yards) plan, a much more Jacobsian way to develop the Metropolitan Transportation Authority’s Vanderbilt Yard. The idea is that if Atlantic Yards does not get built as planned, or is scotched altogether, an alternative plan, with significant bulk but not “extreme density,” limited to the railyards and an adjacent plot, could emerge. Notably, the tallest and bulkiest buildings would be moved east, to Vanderbilt Avenue, while the triangle of land between Flatbush, Fifth, and Atlantic Avenue, currently slated for the Urban Room and part of the Miss Brooklyn tower, would be used for a park. With a smaller footprint (less than half of the 22-acre Atlantic Yards site) and no eminent domain, the site could not accommodate an arena, and with 1500 housing units (nearly 200 per acre, without counting the triangle park), rather than 6430 (nearly 300 per acre), UNITY would not include as much housing. The percentage of affordable housing (60%) would be greater than Atlantic Yards, and 60% of that would be affordable to households earning up to $40,000—far more affordable than the Atlantic Yards plan. While the plan would involve multiple parcels and developers, ideally allowing for a faster build process, and the withdrawal of certain subsidies ($305 million so far, from the city and state) for arena/project infrastructure would presumably free them for other use, there are neither developers nor government commitments attached to the UNITY projections. UNITY 2007 is based on a planning workshop held April 28, under the auspices of the Council of Brooklyn Neighborhoods. The result in turn grew out of a 2004 plan, based on a participatory planning workshop organized by Council Member Letitia James. The 2005 bid for the MTA’s by Extell, the only rival to Forest City Ratner, was in part based on the original UNITY principles. The plan was unveiled yesterday at a press conference and community meeting at the Soapbox Gallery, 636 Dean Street (between Carlton and Vanderbilt Avenues), across from the Atlantic Yards footprint. The UNITY materials will remain on display through October 3. The meeting drew about 100 people. I wasn’t able to attend either event, but I got several secondhand reports and got a copy of the UNITY document prepared by University of Cincinnati architecture professor Marshall Brown (right, a former Brooklynite), Pratt Institute Center for Community and Environmental Development founder Ronald Shiffman (also a board member of Develop Don’t Destroy Brooklyn), and Tom Angotti, director of Hunter College’s Center for Community Planning and Development. I also got a chance to question Shiffman and Angotti. Shiffman (who will join me on a walking tour of the AY footprint Saturday), suggested a lot of things should be on the table: “This is an alternative way of developing the site. It needs alternative financing and a different kind of commitment by government.” One other reason for that, he noted, is to “meet the commitments of PlaNYC 2030,” Mayor Mike Bloomberg’s sustainability plan, which, as I've pointed out, suggests a far more consultative way to develop over railyards. The Yards form the northern edge of a triangle that includes the Vanderbilt and Flatbush Avenue Corridors. One corner is defined by Grand Army Plaza. Another corner is formed by the Atlantic Terminal. Rather than increase the congestion around the Atlantic Terminal by adding even more density, we propose an alternative strategy that concentrates density at the Vanderbilt/Atlantic intersection. This will improve that currently underdeveloped intersection as well as create the opportunity for a large new public square at the Atlantic Terminal, providing an experience similar to Union Square. Brown, I'm told, noted that a building of that height was only one solution for adding density at that intersection. Planners pointed out that the intersection is only eight minutes from the Clinton-Washington C stop in Fort Greene, thus rendering the site sufficiently transit-accessible. And what about the arena? The report calls for a study, stating: The Mayor, the Chairman of the ESDC, the Borough President, and City Council should issue an RFP for a planning consultant to undertake a study to locate a suitable site for a basketball arena to be built in Brooklyn. Would the entire project be built as planned? That is “both highly unlikely and entirely undesirable,” according to the draft report. And even if it does go through, it’s unlikely the project would be built by 2016, as planned. Given the likelihood of delay, organizers recommend a new environmental impact statement. What if nothing gets built? That, obviously, is the organizers’ preferred alternative, and the scenario for the extended report issued yesterday. And what if only Phase 1, involving the arena and four towers (plus one across the street at Site 5), gets built? The draft report warns of “several unexpected consequences with serious negative impacts,” including the possibility that 2000 interim surface parking spaces could become permanent, and that Forest City Ratner—bedeviled by changing market conditions and potential new political configurations—could decide to hold empty properties and cleared sites. 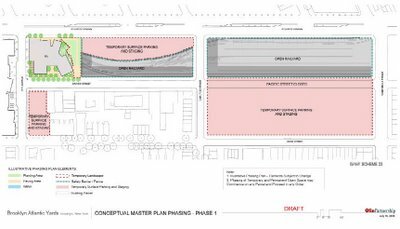 “Therefore, no demolition should be permitted on Phase 2 sites, and no interim parking should be allowed on existing vacant sites,” the report urges, arguing that Phase 1 “must incorporate and satisfy its own parking needs”—a seeming impossibility, according to the Atlantic Yards Final Environmental Impact Statement. The amount of affordable housing, 900 units, planners noted, would exceed that promised in Phase 1 of Atlantic Yards and more affordable housing could potentially be added in the adjacent blocks currently owned by Forest City Ratner. (More likely is that the developer would sell or develop the properties for market-rate units.) And the affordable housing would be guaranteed into perpetuity, rather than 30 or 40 years. UNITY would eliminate the planned superblocks and add streets, putting open space on the edge of such streets and also employing green roofs. (Atlantic Yards would get a significant slice of planned open space by demapping Pacific Street between Carlton and Vanderbilt avenues.) I wasn't able to get a tally, however, for the acreage. Brooklyn has a diversity of densities, building sizes and types. One can find many different scales of buildings around the Vanderbilt Yards. Building heights and massing in our proposal would be regulated to respond to these diverse conditions - from small scale to large. The proposal also suggests that the congestion pricing cordon should be expanded to downtown Brooklyn to reduce traffic. 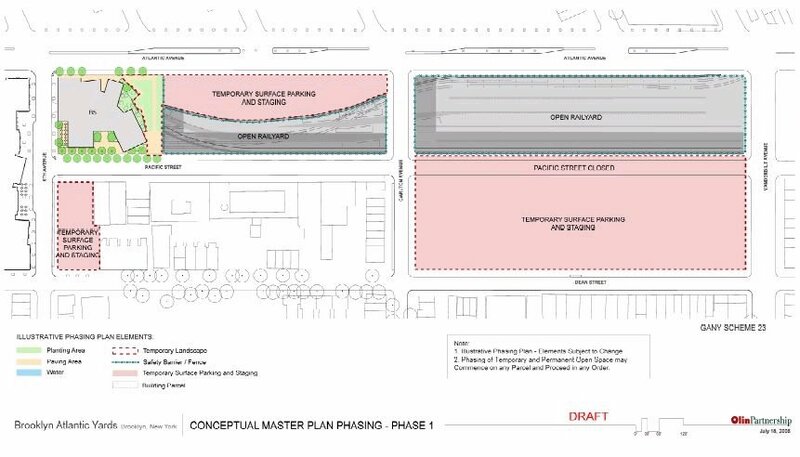 If that occurs, however, the area around the Vanderbilt Yard might become a park-and-ride hub without limits on parking on the site, residential parking permits, and peak pricing for parking. --transform the COC to a trust. Likely? At this point, no. Possible? Stay tuned. We are all Jacobsian now--but what about process? CBN asks: where's ESDC's promised ombudsperson?